The 1st of October, 2018, marked the first day in office of Assoc. Prof. Chulathida Chomchai, MD, who was appointed Dean of Mahidol University International College (MUIC) by virtue of a resolution passed by the Mahidol University Council on August 15, 2018. A faculty member of the Science Division since 2010, Dean Chulathida also served as Assistant Dean for Research from 2011 to 2014. 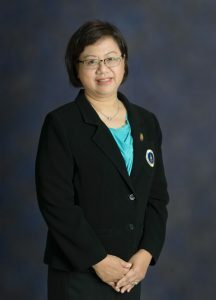 With her concern for MUIC alumni obtaining the best possible graduate education, Dean Chulathida played a major role in successfully establishing the MUIC-SGU Doctor of Medicine Pathway Program, MUIC’s collaboration project with St. George’s University’s School of Medicine that enabled MUIC students to study medicine in a reputable university abroad. She also worked as an advisor and facilitator for the joint BSc-DDS program between the Faculty of Dentistry, Mahidol University and MUIC. Dean Chulathida graduated with a Bachelor of Science majoring in Biological Science from the University of California Irvine, USA in 1989, and received a Doctor of Medicine degree from the University of Southern California Keck School of Medicine, USA four years later. She is also a diplomate of the American Board of Pediatrics and F.A.A.P American Board of Pediatrics: Children’s Hospital of Los Angeles. She started working at the Division of Pediatrics, Faculty of Medicine, Siriraj Hospital, Mahidol University in 1997 and was later appointed Head of the Ambulatory Pediatrics and Toxicology Department. In addition to her field experience, she was also a prolific researcher who published a textbook and numerous articles in the field of toxicology in teenagers and children. As the new Dean of MUIC, Assoc. Prof. Dr. Chulathida will continue to develop the College as it aims to become one of the leading educational institutions in Asia. MUIC aims to produce qualified graduates who are excellent citizens and can achieve work-and-life balance in Thailand and the international community.